Since many types of kanji in shikona are related to the nature as we have seen so far, several of them stand for plants. Rikishi whose shikona is associated with plants don’t look so powerful but look stylish and elegant. Rikishi who are good-looking or do grandstand wrestling often used this kanji as part of their shikona. In other words, many of popular rikishi liked to use this kanji. Their flowery shikona gave a great influence on their own popularity especially among female fans. It was 1957 when the monthly salary system was adopted by Professional Sumo Association and rikishi started to take fixed monthly salary. Before this system, the income of rikishi depended on their own capability of attracting people to the venues. Good-looking and popular rikishi among ladies tended to use kanji for beautiful flowers or plants as part of their shikona regardless of their actual strength. “花” is the kanji which directly expresses the beauty of flowers. This kanji also represents all forms of plants. This kanji was most commonly used as part of shikona before, but now is less often used. This may be because kanji for animals has become more popular as part of shikona than that for plants. Cherry blossoms are the representative flowers of Japan. This kanji has been traditionally very popular among rikishi and so often used as part of shikona. 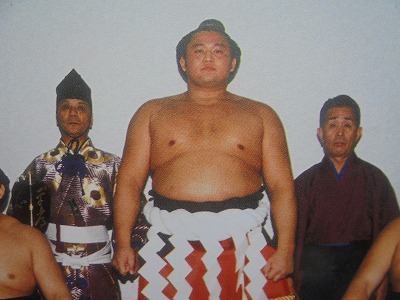 As you know, rikishi wear a topknot on their head just like samurai as they are supposed to follow “Samurai Spirit”. Cherry blossoms fully bloom in a short time and fall very soon after that. Thus the life of cherry blossoms is short and has something in common with that of samurai. “桜” is a new Chinese character form while “櫻” is an old one. Pine tree is culturally defined as a good-luck inviting plant here in Japan. You can see Japanese houses decorated with bamboo branches at the gate for praying for good luck on New Year’s Days. Most Japanese people customarily like to follow good-luck inviting activities and so do rikishi. Until a little ago, many rikishi liked to use this kanji as part of their shikona, but now just only a few rikishi use this kanji. This may be because an idea that this kanji represents good luck has become out-of-dated. You may think that leaf (“葉”) sounds too plain as kanji for shikona. Leaf doesn’t bloom just like cherry blossoms. However, this kanji reminds us of one of the historically great rikishi, “双葉山” (Futa-Ba-Yama). This Yokozuna accomplished a monumental and unbreakable record of 69 straight victories in 1939, and so he has been regarded as the strongest rikishi in the history of Professional Sumo. Thus, he was excellent in strength and also splendid in graceful carriage and courtesy on dohyo. Later, people have attributed the long-lasting popularity of Professional Sumo to Futabayama.